Okay, maybe ‘Premier League stars’ is pushing it slightly, but both Dickson Etuhu and Jay Bothroyd (of Fulham and England fame respectively) turned out for the FIFA ’12 Interactive World Cup (FIWC) UK qualifying tournament in London last night and at least one had their derrieres handed to them by a 18-year old urchin from Birmingham. With 800,000 contestants worldwide needing to be whittled down and the Grand Finals looming on the horizon, 18 contestants from all over the UK gathered in an concrete bunker far below London’s Oxford Street to duke it out to take the UK qualifying spot for the FIWC proper in the US in a few months time. The Final of the UK Qualifiers saw Ty Walton’s Real Madrid pitted against Irishman Adam Johnson’s Real Madrid – how very ‘FIFA’ – with Brummie lad (and 2011 Grand Finalist) Walton eventually emerging victorious by two goals to one – thus securing his place in May’s Grand Final, where prestigious prizes of an invite to the FIFA Ballon d’Or award gala and a coveted $20,000 first prize will go to the eventual World Champion. Oh yes, this isn’t just a gaggle of oily gamers in a warehouse somewhere. This is the real, FIFA-backed deal. 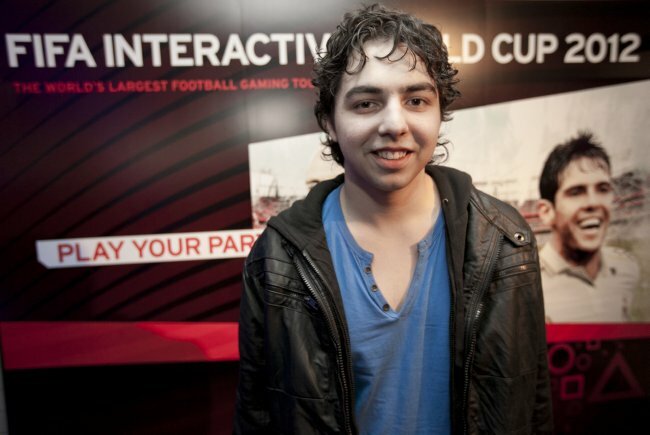 “The FIWC is a fantastic way for football fans from all walks of life to come together and showcase their FIFA 12 skills. Congratulations to Ty, I’ll be making sure I stay away from him online! No jokes about Mr Bothroyd’s day job please.